To encourage the habit of solving puzzles and Sudoku, We organized, Sudoku championship in our apartment Rohan Vasantha, Bangalore. 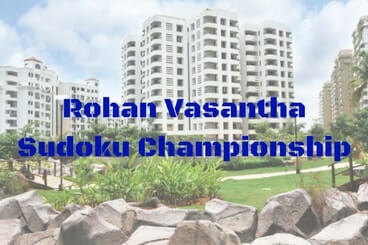 This competition took place on 15th May, 2009 in Multipurpose Hall in Rohan Vasantha Apartment clubhouse. Here are the details of this Sudoku Championship along with photographs of this championship represented in small video. Group A : Upto 7th standard. Group B : 8th to 12 standard. Congrats to the winners and all the participants. Below are the photographs of this championship. 1. Puzzle Ramayan & Indian Puzzle Championship 2017 by Hemant Kumar Malani: Here is very good write up on PR and IPC 2017 by young and talented Hemant Kumar Malani. 2. WSC Sofia 2015 – A retrospective by Rakesh Rai: Read about World Sudoku Championship 2015 write up by experienced Sudoku solver Rakesh Rai from India. 3. The Science And Fun Learning Camp 2016: Checkout about The Science And Fun Learning Summer Camp which was conducted in Rohan Vasantha Apartments. 4. Sudoku Variations Main Page: Checkout more than 30 Standard Sudoku Variation types in case you love to solve Sudoku puzzles.